The kitchen is a perfectly acceptable place for Do-Overs. You know, a chance to go back and remake/retry a dish. 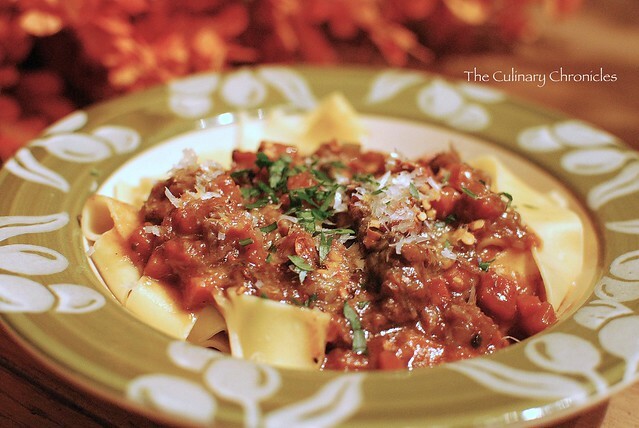 When I first made Bobby Flay’s Short Rib Ragu with Pappardelle, I was quite happy with the results. It was hearty and savory–comforting for the chillier months. There were, however, a few things that I wanted to change the next time I made it. And it was because of this that I called a “Do-Over“! Place a 5-quart casserole or Dutch oven over medium heat. Add oil, and heat until it is almost smoking. Season short ribs generously with salt and pepper. Working in batches if necessary, add short ribs to the hot oil. Cook ribs until browned on both sides. Remove ribs from casserole, and transfer to a large bowl. Set aside. Meanwhile, prepare bouquet garni: Place bay leaves, rosemary, thyme, and parsley in the center of a square of cheesecloth. Bring edges together, and tie with kitchen string. Set bouquet garni aside. Add carrots, celery, onion, and shallots to oil in the casserole, and cook over medium heat, stirring occasionally, until vegetables are softened and golden, about 10 minutes. Add chili flakes and cook for an additional 2 minutes. Add flour and tomato paste to the casserole, and stir to combine. Add ½ cup beef broth; stir with wooden spoon until all browned bits have been scraped from the pan and the bottom of the casserole is clean. Add red wine, and simmer until the liquid is reduced by half. Skim off any grease and discard. Add garlic, remaining beef stock, and the reserved bouquet garni. Return browned ribs to the casserole. Bring the liquid to a simmer over medium-high heat. Skim off any grease and discard. Cover the casserole, and place it in the oven. Cook until ribs are very tender, about 3 hours. Remove the cooked ribs from the casserole. Set the casserole on the stove top over medium heat, and simmer to thicken sauce just slightly. As soon as the short ribs are cool enough to handle, remove the meat from the bones, and shred into small pieces. Degrease the sauce and discard the bouquet garni. Return shredded meat to casserole, and simmer to reduce sauce by about half. Check seasonings and add salt/pepper if necessary. Fill a large pot with water and add a few tablespoons of salt. Set over high heat, and bring to a boil. Salt well, and stir in pasta. Cook until pasta is al dente. Drain pasta, and serve with short-rib ragu, sprinkle with the parsley. Serve with freshly grated Percorino Romano . i made this recipe and it was well received. too bad the plate distracted from how good it looked! The family loves this recipe but it’s sooooo time consuming!